Because the RC2 entry about the Installation of the System Center 2012 Configuration Manager Console is often read, I will give an update to the final. Those three parameters are necessary. For uninstall, just choose the product code from AdminConsole.msi. The new release candidate 2 (RC2) is available, and there are small changes on this topic. First, I would like to say, that the installation of a SCCM Client/Console language is very easy. For the client, you cannot change the user interface language for itself, but it changes it’s language based on the “Display language” of Windows 7. SCCM 2012 – Trace32.exe? No, CMTrace.exe! In SCCM 2012, CMTrace.exe will replace the well known log viewer Trace32.exe. And now it’s an integrated part of the installation. On the first start of CMTrace, it will ask you, if this log viewer should be the default viewer for .log files. 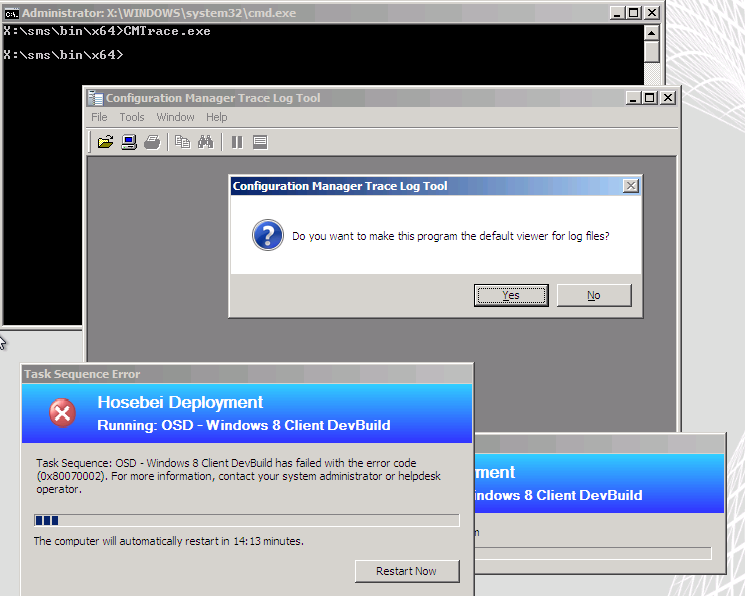 On the server you will find the tool here: [SCCM2012InstallationPath]ToolsCMTrace.exe.